My kids are obsessed with the movie Despicable Me! I did not like the commercial costume at all so I went to work and made my own Homemade Minions Costume. I started with overalls and drew the “Gru” logo on them. Next, I took a yellow hoodie and hot glued black pipecleaners to the hoods for their “hair”. For those that aren’t familiar with the movie, Minions don’t all have the same hair styles so I had my boys each choose which hair-do they wanted. I found their “goggles” at the dollar store and removed the nose, mustache, and eyebrows, then hot glued black Velcro to the sides so they would stay on their heads. The look was finished by using yellow make-up, black gloves and black shoes. The base of the hoodie was taped together. They were the hit of their school Spooktacular event! Where or where can you buy yellow hoodies? I can’t find them ANYWHERE! I might have to buy white and dye them. I am a big fan of dressing up in a theme, as a family, so we have known since April or May that we would be going as the cast of Despicable Me. My oldest daughter (6) will be Margo, second daughter (4) will be Edith, & youngest daughter (1) will be Agnes. My son (3) will be a minion, and my husband was planning to be Mr Gru. That left just me & the kids really wanted me to be Miss Hattie. (I didn’t think her role was big enough to merrit a costume) However, my husband had to leave for a 1 year deployment & now I will be going as Mr Gru. Your costume genious has helped me tremendously in deciding how do make my little guy’s minion look amazing! Thanks so much!! Thanks for the comments! I don’t mind if people copy – that’s why I posted. I had the same problem finding those yellow hoodies last year. I searched and searched Google and ended up finding a website: leadapparel.com. A company named Gildan makes them. Search resale shops for the overalls though to save yourselves some money. We actually did dress as a whole family, but the only picture with my husband as Gru and me as Vector showed our house number so I didn’t want to submit. For Vector: I found cheap orange Hanes sweats at Walmart, sewed white strips down the sides of the legs and on the top of the arms, cut the shirt down the middle and sewed on a white zipper, added a HUGE collar onto the shirt, and wore a bowl-cut wig and wore large black framed glasses. Oh my gosh — my girls have been begging to be minions this year and I’ve been searching everywhere for yellow hoodies, because I had the same thought on how to achieve the look. Thank you so much for posting this & where you got them. They are darling & I can’t wait to get to work on the costumes. Did you use pipe cleaner for the hair? I couldn’t find any minion costumes, and came across your design – Brilliant! My 2 boys are obsessed with Despicable Me…my 2 year old has the movie practically memorized…esp the minion parts…LOL….Well..thanks again! By the way..what did you use for the goggles?? @ Andrea – I found the “goggles” at a dollar store (Dollar Tree). They had these thick plastic lenses as well as hard plastic nose, mustache, and eyebrows screwed onto the frames. I removed the nose, mustache and eyebrows, then hot glued black velcro onto the sides of the glasses, long enough to wrap all the way around the hoodie so they would stay on. You could probably used black elastic, but I liked how we could easily adjust how tight they were with the Velcro. @ Becky – yes, I used black pipe cleaners for the hair and hot glued them (warning – you probably will burn your fingers but it was the only non-toxic glue I could think of that would be strong enough to stand up to a 7 and 4 year old’s abuse). I had both boys look at pictures of minions and decide what kind of “hair” they wanted. Don’t forget the yellow cream make-up for their faces! How did you remove the eyebrows? everything else was screwed on but those are not. Help! I have been looking EVERYWHERE for overalls! Where did you buy them? My daughters too have been dying to be Despicable Me minions, yet i can’t seem to find overalls for them. My daughters: Nicole (3), Alyssa (7), Kylie (13). My oldest daughter Kylie has been convincing me to go shopping for some but I don’t have time! @ Lisa – sorry I forgot those weren’t screwed on. I used a pair of wire snips and carefully cut them off. Took a few passes to make sure the sharp edges were gone. Oh, and we’re reusing them this year for Brainy Smurf! @ Kim – We already had the smaller pair of overalls. I found the larger pair at a resale shop in the girls’ section (and lucked out there was no girly stiching or detail on them). The only retail store I know of that really sells new overalls is Oshkosh but they’ll be expensive for just a costume. If you sew, maybe you could “make” overalls by making the bib and straps and attaching to an old pair of jeans? I am going to be a minion this year for Halloween. I have looked every where possible for a yellow hoodie and no place has them. So I bought a white hoodies from Target for $10. I then dyed it with liquid yellow dye from the craft store. It is a perfect lemon yellow that will match my face paint perfectly. I hope this helps! My daughter wanted so badly to be a minion this year for halloween and I couldn’t find a commercial costume anywhere short of custom ordering and paying a fortune. Your idea has saved me. Both my girls are minions and their dad is gonna be Gru! P.S. I was able to find yellow hoodies at a local thrift shop. Fantastic! The best “Minion” costume out there, better than anything I’ve seen. My boys would love to do this for Halloween. If I can find a tiny hoodie, the newborn can even be one (sans the face paint) and I’ll have 3 minions! And I just realized something else—did anybody else but the Blu-ray version that came with a pair of minion goggles? I bought one and a friend without kids bought one and gave us her goggles so my 6 yr old and 3 yr old could each have their own pair. They’re around here somewhere…all cool and silver, with “rivets” and all. Perfect! One less thing to go buy. I think that the goggles came with a “special edition” that came from either Walmart or Target. You know how funky they are these days about different stores having their own “freebie versions” of kid releases. how did you do the G? My kids are going as minions because of your picture this year for Halloween. For anyone who is looking for bibs, Fleet Farm had pairs that were very reasonable. I found yellow hoodies at a local store, the print on them is hidden by the bib part. I saw lots of people wondering about the glasses, we decided to use safety goggles and they look pretty good. Thanks for the idea, my kids are so excited. How did you do Gru? For Gru, we cheated and ordered a mask. I did not want my husband shaving his head (which he was fully prepare to do)!! He wore dark pants, a dark jacket, and I found a light/dark gray striped scarf he wore around his neck. Thank you all for the wonderful comments! Halloween is truly my favorite time of the year and I love that I married someone who enjoys it as much as I do. This helps make it extra special for our boys! If you have a value village near you, that is where i found my yellow hoodie. You could try other stores like bluenotes or stitches and just turn the hoodie inside out so the decal on the front doesn’t show. I am going to be a minion (I love this movie, too) and my kids are so excited!! Can you please tell me in detail how you did the hair? Did you poke it thru the hood and hot glue underneath? Did you have to add any fabric under the hoodie? thanks so much! This costume is brilliant!!! I did not poke the pipe cleaners through the hoods – too afraid it could harm the kids. I put the hoods on soccer balls to keep their shape while I worked on them. For the one with the one big tuft of hair, I gathered a big bundle of pipe cleaners, covered the bottoms with hot glue, then held it in place on the hood until it cooled. Then I wrapped one more cleaner around the base to keep them together. For the other one I glued one pipe cleaner at a time (big dot of hot glue on the hood, then held the pipe cleaner until it was cool enough to stay in place). Be careful – I burned the &$@! out of my fingers doing this project! hi. i am dressing up as a minion this year. i was wondering how you did the hair without ruining the jacket because it was expensive? Several of my friends & I decided to be minions! I ordered the gold/yellow hoodies from jiffyshirts.com for $12 each and they arrived less than 48hours later-free shipping! We printed off the G symbol and laminated them so they look authentic to put on our overalls. I am dressing my daughter in this costume, but I did the hair a little differently because I am borrowing a yellow hoodie from a relative & I don’t want to ruin it. I bought a large yellow elastic hairband, the kind that wraps around the nape of the neck & over the top of the head. I put the pipe cleaners through that & put it on over the hood when I dressed her in it. Nice costume, That will surely the best fun costume for my kids. Minion go the way, i will like to buy a hoodie and customized in minion way. My next door neighbor and I have been watching Despicable Me (1) all summer. She has a one year old and he absolutely loves the movie, loves bananas, and behaves himself more when the movie is playing. It was amazing for us (as teachers who are off all summer) to have such an awesome movie that kept the kids contained so we could discuss. So, we decided to make it the Halloween costumes for the kids. We have been at it for a few weeks, trying to gather materials to make the costumes, but had been hitting a road block with the yellow sweatshirts. Now, after seeing your website and postings (EVERYONE included) I am super excited to say I am not anxious about making this happen by the end of the month. I have nothing to add to be helpful…. but THANK YOU VERY MUCH! I got my hoodie from a company called CCS. They supply clothing for skateboarders. Put “yellow hoodie” in the search box. $20, free ship, and fast service. It’s a lightweight hoodie, too – so you won’t get overheated at an indoor party. I just dyed a white hoodie. Bought yellow dye was way cheaper than buying yellow sweater. easy and it came out great. Vicki, this is what I am going to make for my boys this year. Thank you so much for sharing. 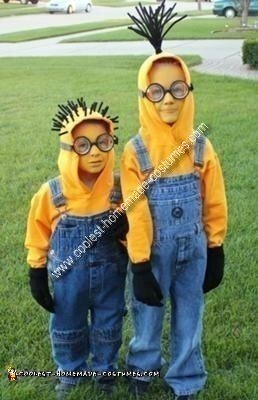 The school fun run this year is on film characters and my two boys are going as yellow and purple minions. Aaaarrrghhh was my first thought – so you have helped me immensely – thank you!